Welcome to 351 Silver Star Squadron! Summer Training application period has passed. Back-fills will commence once the original applications have been loaded. Cadets interested in the wait-list can submit a late application. Staff Cadet application period has passed. National courses are scholarship courses for Level 3+ cadets with a selection process. Application period has passed. The 351 Silver Star Royal Canadian Air Cadet Squadron is located in the vibrant community of Unionville, within the City of Markham, Ontario. If you are between the age of 12 to 18 and are interested in joining us, please visit our Join page. Feel free to visit one of our Thursday training nights. to see what we are all about! All of our cadet activities are supervised by screened adults. In order to continue to provide a safe and encouraging environment for our cadets, we need your help. Many of our staffs are parents of cadets with no previous experience. Contact us now to get involved. Visit these pages to find out more. Individual photos are now available. Details here (username / password same as nominal roll). 351 will have 3 gliding days in the Spring: 21 & 28 Apr, 19 May. 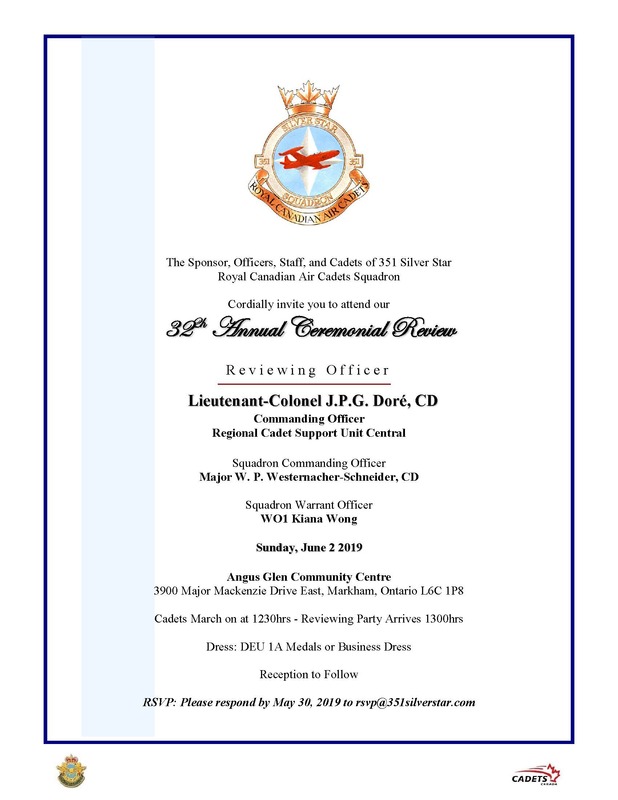 - Gliding (28 Apr PM) (Note: 28 Apr is at CFB Borden. Timing is different; transport to/from Bur Oak; check Warning Order for details). Submit signed permission form (in warning order) once selected on nominal roll. Each cadet should attend one glider flight each year as part of their aviation training. * Cadets who have been on a glider flight this training year may be placed on waitlist until closer to the activity date. 351 will travel to CFB Borden on Sat 4 May for smallbore rifle (.22) familiarization shoot in support of Biathlon training. Adv party leaves Fri 3 May evening (express interest in the Remarks section); main group leaves Sat 4 May. This is a natural progression from the air rifles to smallbore target rifles. - Submit signed permission form (in warning order) once selected on nominal roll. The spring Aircrew Survival Exercise (ASE) will be held on the weekend of 10-12 May 2019. Cadets are required to attend at least one ASE in order to meet their annual training requirements. Squadron photo day will be Thu 11 Apr. Dress to impress! Squadron and team photos will be available for order shortly after. All proceeds go fund squadron activities. Training night for Thu 4 Apr & 9 May will be at Milliken Mills High School due to availability of school. 351 will hold it's 32nd Anniversary Ceremonial Review Parade on Sunday 2 Jun 2019 at Angus Glen Community Centre (West Arena). This is a mandatory parade for all cadets. Cadets shall arrive at 0830 hrs (sharp) in civilian clothing; to change into C-1 after morning practice. Lunch is provided. Dismissal approx 1530 hrs after completing tear down. Parents and friends are invited to attend. Please be seated by 1230 hrs. There is currently NO supply night scheduled. Please check back again later. Initial kitting appointments are usually held Monday or Tuesday evenings. Cadets now have the ability to submit uniform size exchange requests on the Dashboard (go to the bottom of the Dashboard and click Exchange). Cadet with ill-fitting uniform parts can submit a request for a size that fits. Tunics and parkas ordered in Nov 2018 are still backordered from the supplier. Parka availability is contingent on rate of return. Priority is to cadets appearing in public. Cadets no longer with the squadron should return their washed uniform on supply or parade night and include the return form. Cadets get an intro flight in a glider, learn about flying, and have some outdoor sports fun. All cadets should attend at least 1 gliding day each year.